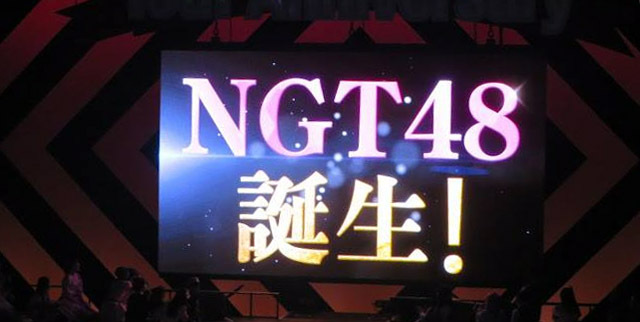 A new AKB48 sister group, NGT48, will be formed. The announcement was made on January 25 during the “AKB48 Request Hour Set List Best 1035 2015″ held at the Tokyo Dome City Hall. NGT48 group will be based in Niigata and a new “NGT48 theater” will open on October 1. The theater manager will be the current theater manager of SKE48, Etsuro Imamura. Along with this, the next SKE48 theater manager will be Yuasa Hiroshi (current AKB48′s theater manager). Replacing him as AKB48′s theater manager is Shiba Tomoya (current SKE48 Kenkyuusei SKE48 theater manager). Auditions for the new group will be carried out in March. More details are to be announced at the AKB48 group official site. During the final day of AKB48's annual event, "AKB48 Request Hour Set List Best 1035 2015" which was held at TOKYO DOME CITY HALL on January 25, it was announced that their new sister group would be formed in Niigata. The new sister group NGT48 will begin recruiting the first generation members starting in March, and will open their own theater, NGT48 Theater, on October 1. With the opening of new theater, Imamura Etsuro, the current SKE48 theater manager, will be transferred as the NGT48 theater manager, and current AKB48 theater manager Yuasa Hiroshi will become SKE48's new theater manager. Also, Shiba Tomoya who is current SKE48 theater manager Kenkyuusei, and former AKB48 team K manager, will be promoted as AKB48 theater manager. NGT48 will be AKB48 group's 5th domestic group following AKB48, SKE48 (based in Sakae, Nagoya), NMB48 (based in Namba, Osaka), and HKT48 (based in Hakata, Fukuoka). They have also expanded the sister groups internationally, as there are JKT48 (based in Jakarta, Indonesia) and SNH48 (based in Shanghai, China). Well this is a good way to see what the new kids will become. Not Sendai? Tanaka Kakuei pushing business to Niigata from his grave. Tohoku needs some love too! What the heck? We need a team out of Hokkaido. NGT48 First Generation Audition Start! 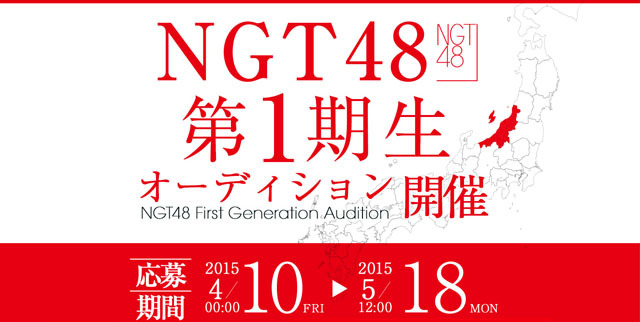 NGT48 official website has announced their first generation members audition officially starts. Application period is from 10 April 2015 to 18 May 2015. AKB48's new sister group NGT48 will participate the 2nd AKB48 Group Draft Meeting, NGT48 theater manager Imamura Etsuro (今村悦朗), NGT48 captain Kitahara Rie (北原里英) and concurrent member Kashiwagi Yuki (柏木由紀) will represent NGT48 at the event. Imamura Etsuro, Kitahara Rie and Kashiwagi Yuki will be representatives of NGT48, they may pick the candidates for the group at Draft Meeting, this year candidates being picked would become research student, the 2nd AKB48 group Draft Meeting will be held on 10 May 2015. TokyoGirlsUpdate.com - Are You Ready? Location of NGT48 Theater Announced! The Stage Will Be Set In Bandai, Niigata-City! NGT48's official theater will open at Lovela Bandai 2 in Niigata. This was announced on May 24th during a press conference held at Niigata Nippou Media Shop. Attendees of the press conference included NGT48 theater director Imamura Etsuro, NGT48 captain Kitahara Rie, and the candidates who were drafted into the group, Nishigata Marina and Ogino Yuka. To Imamura's signal, a video started playing for about 1,100 guests who gathered at the press conference. When it was announced that the theater would open at Lovela Bandai 2, the crowd gave a loud cheer and a round of applause. On the reason for the theater opening at that specific location, Imamura said, "We decided on Bandai as it is accessible, being about 15-minutes away from Niigata Station, and that it's a town where people of different generations come to gather. I want various people to come and visit." 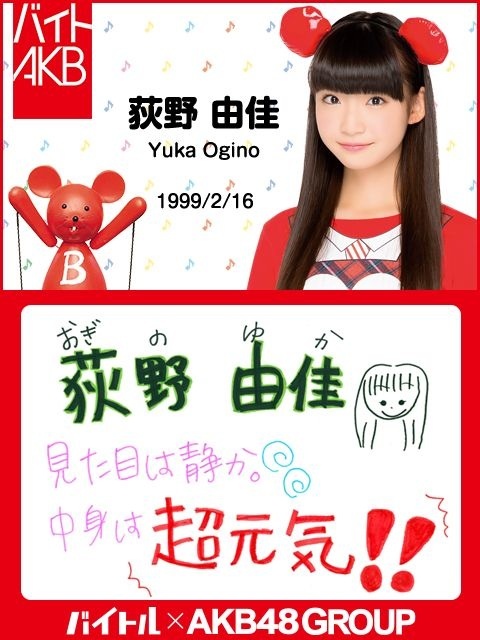 Kitahara added, "It's a fashion building, so I'm expecting NGT48 Theater to be a fashionable theater. Everyone in Niigata, please continue to support us." Besides this announcement, Imamura revealed that there were 5,850 applicants for NGT48's 1st generation audition. It was announced 22 candidates have passed the audition of NGT48 first generation, and 12 of them are from Niigata prefecture. 74 candidates passed 3rd round of audition, and at last 22 candidates have passed final audition, their age from 12 to 20, the 22 candidates participated press conference at 25 July 2015. 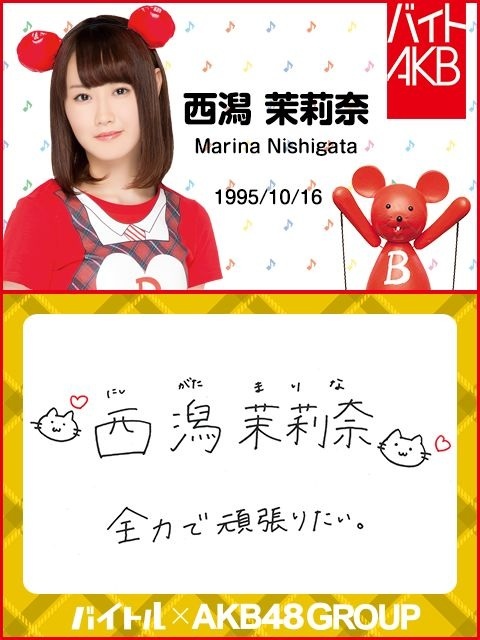 I guess this will be Team N3? 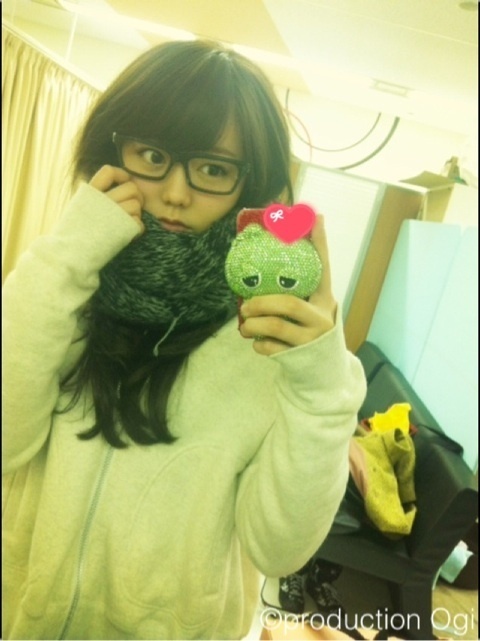 Nr 5 is Kanna Hashimoto lookalike. AKB48 Group and Momoclo!! 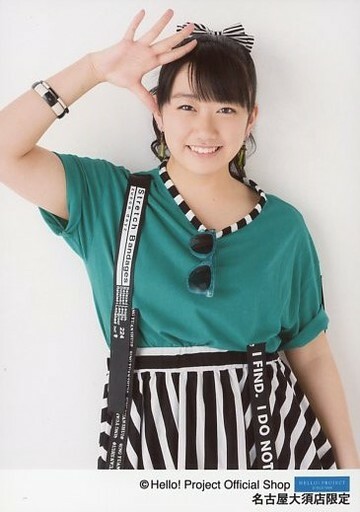 Oshi is Mirukii! Chat? Send me a PM! 22....wonder how many times per week they will be performing? Or if the 22 will be split? most likely if following HKT, they will probably have 14-16 girls (Kitarie and Yukirin included) be N3 but that'll be a while to see your best girls. TokyoGirlsUpdate.com - New Breeze from Niigata! 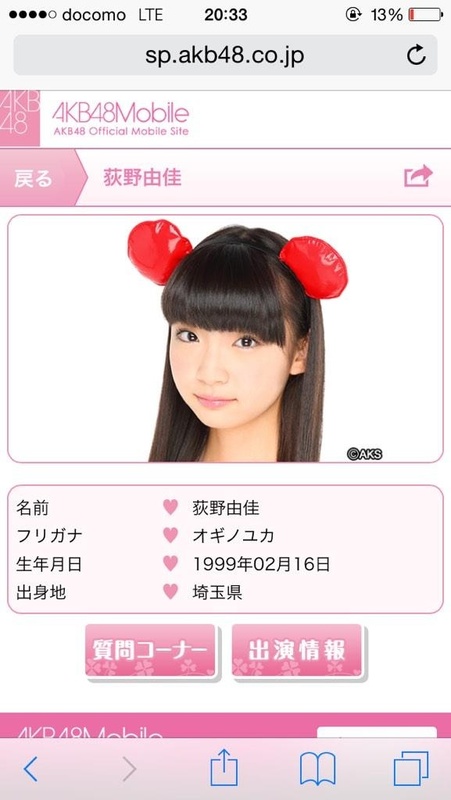 Successful Candidates of NGT48 Are Revealed! Next group should be TTR48 (Tottori based). Page created in 0.399 seconds with 19 queries.